Health & Care > Pet training and behavior > Want A Guard Dog? What Kind Will Be The Best For You? Want A Guard Dog? What Kind Will Be The Best For You? There are all sorts of dogs to fit all kinds of purposes -- Most of us may want a pet just to be a great companion, friend, and life-long buddy. Some of us also want a pet that will be a family protector, a dog that makes you feel more secure for long walks in the city or park, or a dog that you know will scare the bee-geebers off on any potential intruder! When you are looking for a dog that needs to be a guard dog as well as a pet, what kind of dog will work out the best for you? Here are 5 popular and effective guard dogs. It's best if you can get them as puppies if you want them to also bond with the family, especially if you have young children. When acquiring a guard dog, be sure that it has proper training. Obedience classes will teach the proper way a guard dog should act. If children are in the home, look for a dog that interacts well with children. Doberman Pinscher: Since their arrival in the United States in 1908 from Germany, Doberman Pinschers have been used by both police and the military as guard dogs. These alert, fearless dogs are loyal and obedient. Dobermans are energetic dogs that train easily. They make for loyal companions and are always ready to protect the home. Rottweiler Once used for cattle driving in Germany, Rottweilers now have the reputation of being one of the best guard dogs. 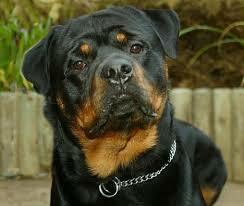 Powerfully built, Rottweilers are obedient and imposing. It's important that they have proper human socialization and professional training for functioning as a guard dog. They are very faithful dogs and can become overly protective if they feel a family member is in danger. Bull Terrier The Bull Terrier was bred to be a fighting dog in England. Although it's up for a fight, the Bull Terrier isn't one to provoke one. Bull Terriers are fun and playful and have a mischievous side to them. They are sweet and affectionate, but, also quite protective. Overall good with people, the Bull Terrier does not always take well to other dogs. There are many more dogs that can become wonderful guard dogs for you and your family. Even a small dog can be great at alerting you of danger or of a problem in your home, like smoke, fire, or other danger. Having a dog as a pet and companion is a special and unique experience for each person -- start looking for the pet that you know you would like, do some research, try to find some breeders to see and play with the pet you think you'd like, visit the local animal shelter for many wonderful dogs up for adoption -- You'll find just the right companion, friend, and maybe even a guard dog if that is a trait that you also want to find in your pet. Woof! Happy tails to you!